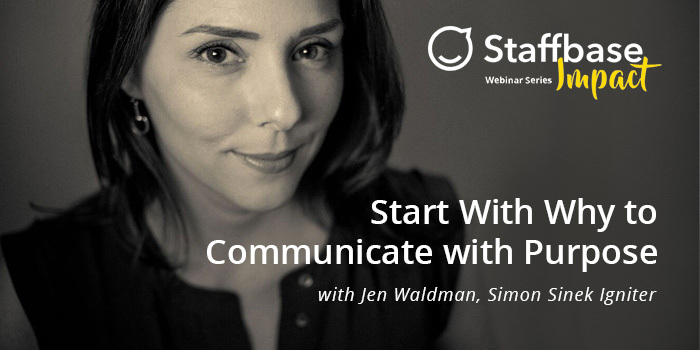 Learn new business strategies from Jen Waldman, Simon Sinek Igniter, as she relates "Start With Why" to your work as an internal communication pro. Jen Waldman and Simon Sinek united several years ago when Simon became aware that Jen was using the Golden Circle to inspire artists to make a greater impact with their work. The two recognized that by combining their efforts they could help people across many different industries discover their WHY and bring it to life. Jen travels the world offering Why-inspired keynotes and workshops on leadership, communication, and presentation skills. In addition to her work with Start With Why, Jen is the Founder and Executive Director of Jen Waldman Studio, New York City’s premiere training studio for Broadway actors, including Tony Award winners and nominees. Learn more about Jen at www.startwithwhy.com/igniter/jenwaldman.